Chronicles and histories were important to medieval monasteries for at least two reasons. First, chronicles and annals could be important in supporting claims to lands granted them in the past. Also, history meant the story of the world since the beginning, in other words the creation as told in Genesis, and it was the story of the Fall and salvation through Christianity, in which the monasteries were believed to be playing a role. This collection probably was from Lichfield. 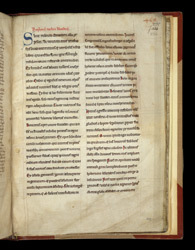 A single leaf of two separate 'Prophecies of Merlin' concludes the book.